New Delhi: The Congress said Monday that political parties or other groups should not resort to "irresponsible criticism" of the Kashmir interlocutors "who were doing a sensitive job in national interest". Congress spokesman Shakeel Ahmed told reporters that the recent criticism of the interlocutors by some political leaders would "dampen the morale" of the team that had just "begun a delicate and sensitive job". Ahmed's remarks come on the heels of criticism of the interlocutors by Bharatiya Janata Party (BJP) spokesperson Nirmala Sitharaman who accused one interlocutor, Dileep Pagaonkar, of "overstepping" his brief. Sitharaman had criticised a statement by Padgaonkar in Srinagar Saturday that "Pakistan should be involved for a permanent solution of the Kashmir issue". Asked whether the interlocutors were speaking against the declared national policies, Ahmed said there was no dilution of the stand that "Kashmir is an integral part of India". The central government had Oct 13 appointed three interlocutors - journalist Dileep Padgaonkar, academic Radha Kumar and Information Commissioner M.M. Ansari - to meet representatives of "various shades of opinion" in Jammu and Kashmir and suggest ways to defuse the dragging crisis in the violence-hit state. At least 110 people were killed, mostly in firing by security forces on violent street protesters, in Kashmir Valley since June 11. 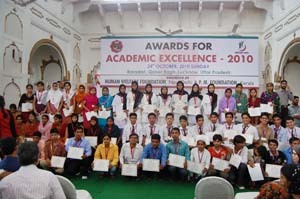 394 meritorious students belonging to Muslim minority community were given Award for Academic Excellence in an award distribution ceremony held at Baradari Qaisar Bagh, Lucknow. The awards to these students were given jointly by Delhi based NGO Human Welfare Foundation (HWF) and PM Foundation Kerala on October 24 this Sunday.